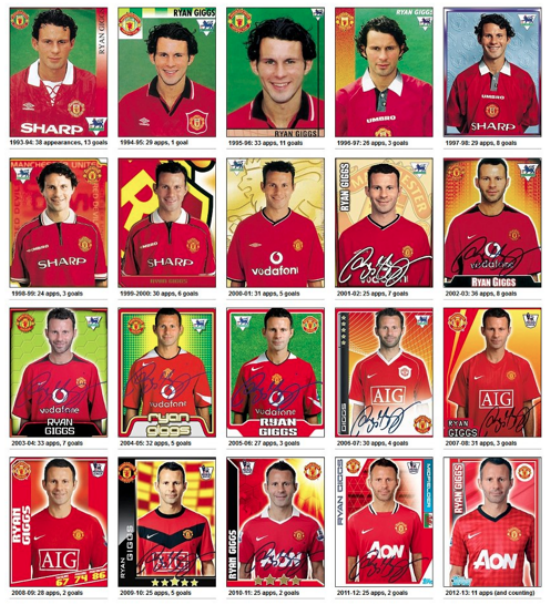 At 39, Giggsy’s not getting younger – though it would appear that he’s not actually getting any older either! And he’s David Silvas’ dad. I’m pretty sure he and Javier Zanetti are highlanders, immortal and doomed to play football forever until one finally beheads the other. His shirt gets tighter each year. If he sticks around, they will have to paint it on him next year. i hate united with every ounce of my body. they are truly scum of the earth, but 20 years with one club and looking classy every year doing so, not even i cany deny, Giggs is for me, and i dont think im alone on this, the most respected player in the epl. Those United jerseys with the tie-up collars are ACE. Ah… the days when teams had kits for more than 1 season! Still remember the shock when he got his curly bap chopped. It’s pretty weird seeing him now in his early 20’s, but still a pleasure to see the old videos when he ran around entire teams like a time traveller from the 21st century. A true ambassador and a gentleman, he’s up there alongside Charlton & Best in the all-time United greats. Wonder will he consider management? What an example he is…true man u Legend!!! You can see when he starts loosing his hair. Cool.